Solar flares are huge explosions of energy from the Sun. They may also be known as solar prominences or, in some circumstances, coronal mass ejections (CME). The energy contained inside a solar flare is immense, ten million times more powerful than a hydrogen bomb. 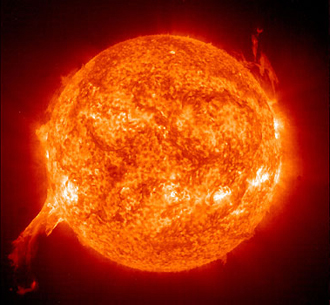 They produce huge levels of heat and light, throwing out radiation and particles from the Sun. The energy that is required for a solar flare to be produced can take days, even weeks, to build up. However, once the energy is released, it is over within minutes. The blast of energy in a solar flare is so powerful that it can take minutes for it to travel from the Sun to Earth - that's a journey of 150 million kilometres (93 million miles). And once it reaches Earth, it can cause all kinds of chaos. Yep, they can mess up your television reception and phone signal, amongst other things. Solar flares are caused by the same process that produces sunspots. Sunspots are areas of intense magnetic activity which prevents some of the Sun's energy, such as heat, from reaching the Sun's visible surface (its photosphere). Therefore sunspots are cooler than other regions of the Sun and are also darker. However, although the Sun's energy is prevented from reaching the Sun's surface in sunspots, it builds up in areas nearby. Eventually, this energy builds up so much that it blasts out of the Sun and into space with such power and force that it produces a solar flare. The Sun goes through an eleven year period of activity. At its least active - during solar minimum - there are very few, if any, sunspots and their related solar flares. However, during solar maximum, the Sun is at its most active, and spottiest, and sends out flares aplenty. On an typical active day, the Sun will produce several flares. As we know, the Sun produces heat and light, and is what keeps Earth warm and, um, light. Heat and light are examples of electromagnetic radiation. The Sun continually pumps out radiation and charged particles of electrons and protons, sending them across the solar system and into space by a process known as the solar wind. The solar system is said to end at the point where the solar wind is no longer able to push the particles any further. This point known as the heliopause and is many billions of miles further away than the most distant known planets. As the solar wind passes the objects in the solar system, it interacts with them in the several ways. The solar wind carries the Sun's heat (thermal radiation) and light to Earth. It also carries invisible radiation, such as ultraviolet (UV) light, to Earth. UV light is what causes people to tan, or if exposed to it for too long, burn. Excessive exposure to ultraviolet light can cause serious illnesses. Ultraviolet light is an example of the dangerous radiation that the Sun produces. In fact, Earth ozone layer, about 20 to 40 kilometres (13 to 25 miles) above the surface, absorbs about 98% of ultraviolet light, meaning that only a small percentage of it actually reaches the surface. This is just one example of how Earth protects itself from the dangers of the Sun. The Sun produces other kinds of radiation, with different effects, and Earth deals with them in different ways, even to the point of producing its very own light show just to show off. When solar flares occur, they intensify the effects of the solar wind, as they pump additional levels of the sun's energy - radiation and particles - into space. This kind of intensified activity is known as a solar storm. As an example, the Sun produces electromagnetic radio waves and microwaves. On Earth, certain technological items also produce these kinds of waves as a way of sending signals. These include television and radio transmitters, mobile/cell phone masts and satellite dishes. Like the Sun, Earth also has a magnetic field. Usually when the electromagnetically charged particles from the Sun reach Earth through the solar wind, Earth's magnetic field repels them. There ain't gonna be no harmful electromagnetic thingummies gettin' to Earth, y'hear!? Some of these particles do get stuck in a region surrounding Earth called the Van Allen belt, which is an area of intense radiation, and is of concern when sending astronauts into space. But during a solar storm, when the effects of the solar wind are more intensified, quite often as the result of increased solar activity (solar flares) they do get through the Earth magnetic shield and get into Earth atmosphere. And that's where the fun begins. Kind of. The electromagnetic radio waves from the Sun interfere with the electromagnetic waves produced by radio or television transmitters. This usually reduces the quality of the signal being received by radios or television sets, making them seem like they need retuning. Sound may become unclear and crackly, and picture quality may break up or become grainy or blocky. When solar flares aren't affecting people's enjoyment of their favourite television shows, they produce beautiful light shows. Charged particles sent from the Sun interact with particles in the Earth atmosphere. They cause the particles to glow and light up the night sky. This occurrence is known as an aurora and usually occurs in areas near to the poles, in the far north or far south regions of Earth (northern Scandinavia, Greenland, Alaska, Canada, southern New Zealand and Australia, South America and Antarctica). An aurora in the northern hemisphere is called the aurora borealis, or the northern lights, and in the sourthern hemisphere, it is called the aurora australis, or the southern lights. During particularly strong solar storms when the sun is in the solar maximum part of its solar cycle, an aurora may be seen further away from the poles. The video below shows the aurora australis filmed from Antarctica.